I have finished the research part of my blog book. This is important because I foolishly stated in March that I would not cut my hair until I finished my book. I had received a particularly bad haircut at that time and wished I had gone to my regular hair stylist. Unfortunately, she was a bit more expensive than I could afford after three months of illness, so I thought I’d give myself an incentive. Then I got into a car accident which totaled my minivan, scrambled my brains, and gave me some prolapsed disks in my back & neck. Three months later, the only thing I had accomplished with this noble, nay, manly sacrifice was to grow my hair. Lots of hair. Luxurious, shiny hair. In 100°F weather, I am wishing I was less manly. In fact, after riding my bike to the physical therapists yesterday, my hair curled up on the sides in stringy wings. So cute & feathery. 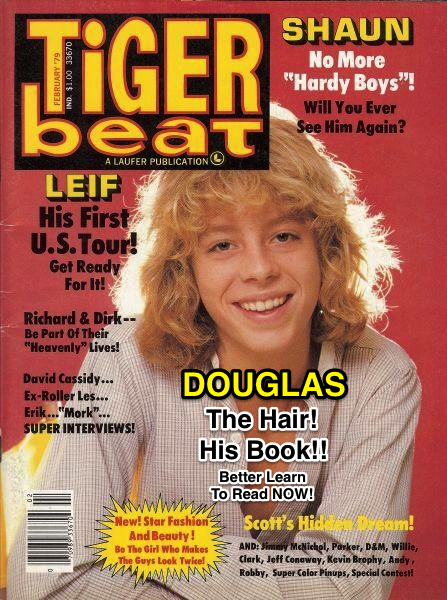 Like a heavy set Leif Garrett. The secretary at the physical therapists’— who was wearing a neon pink blouse—said my hair looked nice. I suspect her taste in fashion is skewed. So, in the interest of not wearing Leif Garrett’s hair, or looking like Cousin Itt, I opted two weeks ago to switch book projects to the shorter one so that I could justify cutting my hair sooner. I had already planned on releasing two blog books simultaneously with the book on Depression that I was working on, so it wasn’t a 90° turn into Distractionville. So why make a big deal out of not cutting my hair? It’s hot. Why not just go cut it? I simply won’t allow myself to cut it. That would be quitting. I know it’s all rather silly, but the truth is that many of my accomplishments wouldn’t happen if I didn’t melodramatically stand on the burning pyre of my life and declare with intense purpose that I will accomplish a Great Thing or die trying. Sometimes I need big goals to push me, and sometimes I need big penalties to push me. The current heat wave is pushing me hard towards finishing that book which is all part of the plan, even if a few months behind.